Greater recognition must be given in Ireland's welfare system and tax codes to the cost of rearing children, former Taoiseach says. 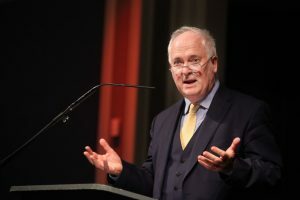 Former Taoiseach John Bruton has told members of the pro-life movement that they must “create a supportive environment for life” in the wake of the referendum on repealing the Eighth Amendment. In his keynote address to 800 people who attended the pro-life education dinner in Dublin on Saturday evening, the former Fine Gael leader said creating a supportive environment would involve solving the housing crisis, because “the non-availability of affordable housing is a deterrent to bringing a new life into the world”. He told those at the gathering who object to new housing developments in their own areas that they should ask themselves if their objections are consistent with their pro-life convictions. Creating a supportive environment for new life would also involve giving “greater recognition to the cost of rearing children in both our welfare and our tax codes”. He singled out the Minister for Health, Simon Harris, for criticism, noting that the Minister had claimed that the “Yes” campaign was built on a “coalition of compassion”. “He thus seemed to imply that those who voted ‘No’ are not compassionate. Maybe that is not what he meant, but nothing could be further from the truth. He spoke of the referendum meaning that we are ‘maturing into a tolerant, non-judgemental, inclusive Republic’. The Minister’s own speech was rather judgemental, and not particularly tolerant of those who sincerely disagree with him on the issue of abortion,” Mr Bruton said. Mr Bruton said he feared that doctors who are known to oppose abortion will be targeted under this clause by people wishing to catch them out and put them under threat of criminal prosecution because of their religious or human rights beliefs. “There have been examples of this sort of targeting in other fields, where there are strong but conflicting views in the population. Mr Bruton described this as “very loose ground for ending a life”. “It involves the doctors in making a prediction about the future mental health of the mother after the baby might have been born”. “Whatever about adjudicating about present mental health, deciding about future mental health is completely speculative. And on the basis of that speculation, a baby’s life is to be ended. Indeed, it is arguable that having an abortion is more likely, at some stage in the future, to trigger mental problems,” he said. Mr Bruton encouraged those attending Saturday evening’s dinner to lobby strongly for amendments to the Government’s legislative proposals which will be introduced to the Dáil in the coming weeks. “We must continue to work vigilantly at legislative level, within the new constitutional dispensation. And there is much that can be achieved in the immediate future,” he stressed. 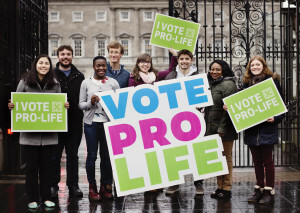 In addition to encouraging people to lobby for amendments to the legislation, Mr Bruton also called on pro-life supporters to play an active role in proposing positive alternatives to abortion.